On January 31st, 2010, Milan and a few neighbor areas declared a total traffic ban to reduce air pollution. Since such measures are already used in other countries or may be adopted in the coming years, the protests and questions raised in that occasion are useful to think about the real usefulness of traffic bans in general. 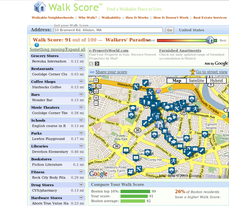 Walkability: check it before choosing your next home! Walkability is a characteristic of homes and apartments that all their owners, or everybody considering (even in these times) buying a new house should know and think about.